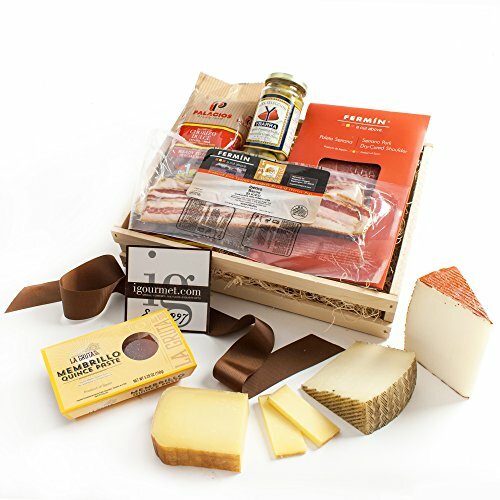 The Gourmet Gift Crate Includes Mahon Cheese (approx. 8 oz), Murcia Cheese (approx. 8 oz), Manchego Cheese (approx 8 oz), Fermin Iberico Bellota Bacon (8 oz), Serrano Ham (2 oz), Chorizo by Palacios (7.9 oz), Quince Paste (Membrillo) (8.45 oz), and Ybarra Spanish Olives Stuffed with Piquillo Peppers (5 oz) The KaBloom Gift Basket Collection consists of a variety of gourmet gift baskets including cheese gift baskets, chocolate gift baskets, charcuterie gift baskets and More!